Where is St. Martin’s by the Lake and how do I get there? St. Martin’s by-the-Lake is located on County Road 15, at the corner of Westwood Road, about 4 miles west of Wayzata and about 1 mile east of Navarre. View our address and an interactive map here. How do I join St. Martin’s by-the-Lake? One becomes a member of St. Martin’s by being baptized into the Christian faith, or by being received or confirmed in the Episcopal Church. Baptism is the basic entry into Christian faith, and any baptized person can join St. Martin’s by indicating their intention to the Rector. 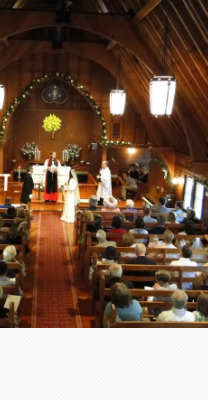 Membership is maintained by attending Sunday worship and by contributing to the financial support of St. Martin’s, usually through making a pledge. Friends are persons who wish to be associated with St. Martin’s, receive mailings, etc., but who do not attend or contribute regularly. Who do I call for weddings, baptisms, hospital and shut-in calls, funerals, etc.? To schedule baptisms, weddings, sick calls, funerals, or any other pastoral care, please call (952-471-8429) or e-mail the church office. One of the clergy will be glad to discuss any questions you may have and help in making arrangements. Baptisms and weddings do require preparation, so please allow time to meet with clergy. How do I donate flowers? Call the church office at 952-471-8429, or complete this online form. What is the history of St. Martin’s by-the-Lake? As weeks passed his generosity continued to grow, and he eventually donated the entire building as well. He and his wife were also inspired to this work because they had had three children die in infancy. The fourth daughter, Lou, survived into adulthood and that autumn was going to be married. The Camps decided to dedicate the chapel to the memory of the three children that had died, and in celebration of the marriage of the daughter that lived. It was a sign of their faith in God made manifest. We remember that faith when we worship here as well. The architect, Cass Gilbert, was the designer of the Minnesota State Capitol, the George Washington Bridge, and the U. S. Supreme Court building, as well as the cousin of Bishop Gilbert. He designed the building in “the seaside style of New England” and modeled the interior after that of a Stave Church in a museum in Oslo, Norway. St. Martin’s by-the-Lake is part of the Episcopal Diocese of Minnesota, and our diocesan bishop is the Right Reverend Brian N. Prior. St. Martin was born in what is now Hungary about 316, the son of a Roman military official. His family was pagan, even though Christianity was growing more popular with the conversion of Emperor Constantine. He was drawn toward Christianity as a child, and by the age of twelve had told his parents he was interested in becoming a Christian. They were not supportive. At about the age of 15, Martin was enrolled in the Roman army, according to the standard recruiting laws. His regiment was transferred to Gaul, now France. It was there that we have the story illustrated in our beautiful St. Martin’s window. In France, Martin decided to become a Christian and entered the catechumenate, the three-year process during which candidates were taught the faith in preparation for baptism. Seeing a naked beggar, Martin was filled with compassion. He took his sword and cut his cloak in half. Remember that a cloak was not the stylish accessory we consider it today. It was a coat by day and a blanket by night when camping out with fellow soldiers. That night in a dream, Jesus appeared to Martin, saying, “When I was naked, Martin clothed me, and him only a catechumen!” Martin was baptized, and when his regiment was to be sent to war, he asked for release from military service because of his Christian faith. When he was accused of cowardice, he offered to go unarmed into the front lines of battle, putting himself between the two opposing armies as a soldier for Christ. He was released from service and became a follower of St. Hilary, one of the bishops of Gaul. He became a hermit, living a strictly disciplined and primarily solitary life, although he did travel to preach the Gospel in rural Gaul. Martin lived a pious and holy life that was so celebrated that in 372 he was chosen by the people of Tours to be their next bishop. Although he initially refused, the people tricked him into coming to Tours to prepare a sick woman for death, and when he arrived, they had him ordained bishop. As bishop he took the often unpopular stand of asking for mercy for heretics, rather than demanding their execution. Unlike many of his episcopal contemporaries, Martin maintained his monastic lifestyle to the end of his life, living simply and tending the sick, feeding the hungry, visiting those in prison, and pleading mercy for the condemned.